One of the worst museum heists in history, some searing portraits of childhood and a dark part of New Mexico's history are among the best movies and docs. Whether we revisit our childhood with fresh eyes in Alfonso Cuarón's “Roma,” poke fun at one of history’s biggest botched heists in “Museo” or break down gender barriers through the music of Linn Da Quebrada in "Bixa Travesty," it was a year of truly memorable films that are drawing worldwide praise from critics. There were some favorite festival movies — like the Mexican horror movie “Feral,” the Mexican domestic drama “The Chambermaid” and the creepy Chilean stop-motion fairytale “La Casa Lobo,” that were excellent and hopefully will find a bigger release. The good news is there's more to to look forward to, as movies like Colombia’s Oscar contender “Birds of Passage” is released in February. 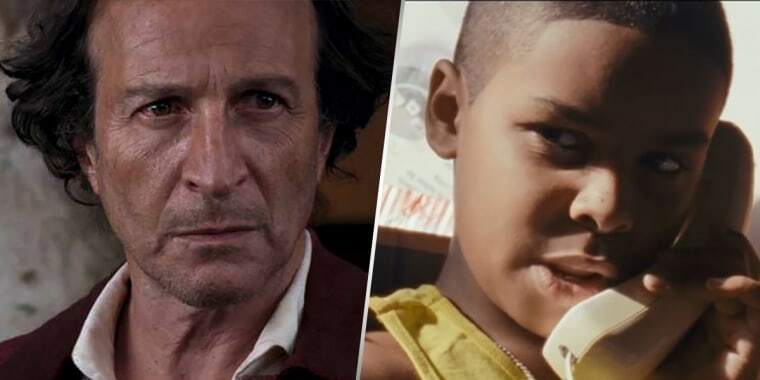 Here's a list of what to watch — and where you can see it if it's being streamed — to get a taste of some of the best of this year’s Latin American and U.S. Latino movies. Alfonso Cuarón’s opus dedicated to the women who helped raise him is one of the most talked about contenders for this years’ Academy Awards. Though its meticulous black-and-white design may push away some viewers, most have been swept up in the meticulously composed images and the dramatic story of Cleo, the character based on the domestic worker who helped raise Cuarón. The first-time actress who plays Cleo, Yalitza Aparicio, embodies the insecurities and vulnerabilities of someone stuck between the feelings of duty to her job and and her life outside of work. Set in the early 1970s in a Mexico City neighborhood, (Colonia Roma), the movie not only captures Cleo’s experience working for a middle-class family but the feeling of a city at that time, down to the sounds of old cars, street vendors, children playing and the occasional marching band practice. Stream it on Netflix now. Like Cuarón, Argentine director Lucrecia Martel has an ear for sound and how to play with it in her movies. It’s a skill that creates a strange, unnerving feeling throughout her latest movie, “Zama,” which follows Latin American-born Don Diego de Zama (Daniel Giménez Cacho), an 18th century Spanish bureaucrat who is trying desperately to reunite with his family from his faraway post. In a Kafkaesque dark comedy of bureaucracy, Zama is taken further away from his family and deeper into a jungle he does not belong in. While following Zama’s fall from grace, Martel illustrates some of the cruelties perpetrated in the name of the crown and the inhumanity caused by colonialism. Zama’s journey is dark, but it is a wonder to watch and listen to. You can stream it on Amazon Prime. In Alonso Ruizpalacios’ “Museo,” Gael García Bernal plays Juan, a no-good schemer who concocts a plan to make him and his best friend, Wilson (Leonardo Ortizgris), rich. Unfortunately, the plan to rob priceless artifacts from a Mexico City’s National Museum of Anthropology was a poorly laid out one that soon crashes on them both. Based on a true story about one of the messiest museum heists in modern history, “Museo” explores the meaning of ownership when it comes to priceless art and what it means to deprive society of its cultural heritage. Or, you can just watch the movie for García Bernal’s bad boy antics and Ruizpalacios’ wicked sense of visual humor. Brazilian singer and performer Linn Da Quebrada is a black trans woman who has turned her experiences growing up in Sao Paulo into infectious songs, her lyrics into declarations of her trangender identity. Through outrageous club performances, she reclaims the slurs thrown her way with confidence and waves away criticism with a Edward Scissorhands-like metal glove. They cannot hurt her or her dancing and singing entourage here. Kiko Goifman and Claudia Priscilla’s documentary observes De Quebrada offstage as well, relaxing among friends and family, playfully giving love and life advice on a radio show, candidly recounting her story of surviving cancer and sharing how she has taken on Brazilian machismo. Rudy Valdez’s documentary is any family’s worst nightmare. His sister, Cindy Shank, was arrested after her ex-boyfriend turned up dead and in possession of enough drugs that she was convicted as an accessory to his crimes, a charge that carried a minimum sentence of 15 years. Valdez’s documentary painfully watches as her life changes behind bars as her daughters, on the outside, grow up without her. “The Sentence” is available to stream on HBO. Another honorable mention is “Crime + Punishment,” a documentary about police corruption in New York City and its impact on Latinos on either side of the badge. It’s available to stream on Hulu. Jeremiah Zagar’s achingly beautiful adaptation of Justin Torres’ book brings to life the story of three brothers — Manny (Isaiah Kristian), Joel (Josiah Gabriel), and Jonah (Evan Rosado) — growing up in a tumultuous household led by their argumentative parents (Sheila Vand and Raúl Castillo). The boys learn to hit each other from their abusive dad, but the soft-spoken Jonah takes after his sensitive mom and begins to express his anger through art instead of fist fights. “We the Animals” is a gorgeously soulful movie, a difficult coming-of-age story that’s just as much about violence, childhood and sexual identity as it is about forgiveness and self-preservation. You can rent it on Amazon/iTunes. If we don’t know our history, we are doomed to repeat it. That about sums up the spirit of Robert Greene’s multi-story documentary, “Bisbee ‘17,” which profiles an Arizona mining town’s centennial commemoration of a dark time in its history. Back in 1917, some two thousand immigrant laborers were rounded up and deported to a New Mexico desert and left to die. The main reason given was that the striking laborers posed a threat, but the men were mostly Mexican and Eastern European. The descendants of the survivors and newcomers to Bisbee must figure out what the legacy of the deadly deportation means to Bisbee’s past and present, given the hardened national attitudes toward immigrants. The town lies only a few miles from the U.S.– Mexico border.